Dionelle is a young girl born immune to fire and with magical talents, and thus destined to work with dragons, who wouldn’t hesitate to burn humans to death if they felt offended. A vicious noble woman in the district forces Dionelle to work as Dragon Whisperer, though Dionelle hasn’t finished her training as a sorcerer. This is not necessarily a bad thing since Dionelle really wishes to communicate and work with the dragons, and she seems especially talented for it. But she struggles with her worried new husband, Reiser, in addition to the cruel Lady, while she tries to finish her magical apprenticeship. Then one day she goes missing and in order to find her her husband must face his prejudice and fear: the dragons. In the opening pages we witness an event which took place while Dionelle was still unborn. Her parents and Reiser’s parents make an agreement concerning Dionelle’s elder sister, Vyranna, and Reiser, but since they are worried about Vyranna’s aggressive and violent temper, they include Dionelle in the agreement. When the book begins, we follow Dionelle and Reiser in the first days of their marriage. We learn that Dionelle can talk to dragons and that Reiser is terrified of them, mostly because his lack of knowledge of them. The events in the first chapters of the book move slowly and quietly. The depths in the different human relationships and the anxiety the newly wedded have concerning their new situation, are well written, but, as the impatient reader I sometimes am, I kept waiting for action: where are the dragons! Because, with the exception of an event on the first pages where Dionelle stops them from killing the neighbour’s livestock, and small drops of information about them scattered here and there, there isn’t much in the first part of the book that smell of dragons, steaming sulfur or thrilling adventures. It wasn’t until Dionelle was forced by Lady Dunham to encounter a dragoness at the end of chapter four that I started to really get captivated by the story. I kept wondering why the author had put such trivial details in the beginning of the book, like the description of the first night in Reiser’s house, and later a detailed telling of the wedding ceremony. I wondered why the book hadn’t been tightened up and why there was this much telling. In hindsight, after having read the whole book, I see I might have been wrong. Because it is an intelligent plot Ricci-Thode weaves through the book. It may seem quiet and trivial, but she establishes the tension detail by detail, page by page, and slowly feeds the reader with small pieces of information about the dragons and their world, the demons, and the intricate matters of court, the magicians, the religion, the customs. In the end you’ll want to know more. There are especially two things I liked with this book. The first is of course the dragons. I’m no expert or scholar in dragons or dragon mythology, but like most fans of fantasy literature, I’ve read a lot of dragon books or books with dragons (for instance Christopher Paolini’s Eragon, Ursula K. Le Guin’s Earthsea books, and The Dragonriders of Pern series by the late Anne McCaffrey. I’m fascinated by the idea of dragons in our culture and mythology, and I’m fond of these scaled, beautiful beasts. But I’ll admit I easily get bored, because it seems they don’t change much. Of course there is nothing wrong with good old-fashioned dragons, but I find that authors rarely bring anything new to them. Dragons are usually constructed as winged reptilian creatures, which breathe fire and often have magical abilities. Several sources claim the constructions of dragons can mainly be divided into two main categories: East Asian dragons, which are benevolent, wise and lucky, and European dragons, which more commonly are evil, aggressive and fearsome. I’ll not dive deeply into this here. There is plenty of material out there for those interested. But I realize that, given how long time the dragons have been in our history and folklore, and given the amount of dragons that lurk or crawl or fly in the shadows of different cultures, and even though there apparently are two main categories, it’s not an easy task to bring something new to them. I think Ricci-Thode both succeeds and fails in this. On one side her dragons are exactly the stereotypical aggressive creatures that we are used to see, those with a fondness for glittering beautiful treasures, and who you must address very politely and carefully, or otherwise… Ricci-Thode’s dragons are fond of mysteries and they love to watch human children play and grow, just as much as they love to watch the human artists paint beautiful art. It seems to be a weakness of theirs, that they get so involved and distracted when either a new mystery arrives or a beautiful human talks to them. But I think Ricci-Thode explains the dragons’ obsession with beautiful things well, so that I understand them. And this is exactly what Ricci-Thode offers the readers: explanations. This book was, in many ways, an anthropological field-study of the dragon world and the ways of the dragons. Through the curious eyes of Dionelle, her new friend Ondias, and Reiser, we get small and huge fragments of knowledge about the dragon world, their homeland, religion, magical abilities, social and political structure, music, eating habits, mating, and so on. This is, in my eyes, the strength of this book, because it gives depth to the relationship between the humans and the dragons, and it makes it possible to identify the different dragons as own personalities, and not just a bunch of monsters. Bravo! And on a deeper level, maybe the book is just that; a way to understand the other, the different, to face the monsters through knowledge, and allow them to trust us. Because that’s what the dragons in Dragon Whisperer do. When the humans are curious and want to learn more about them, the dragons start to trust the humans and little by little allow them into their world, building new and beautiful relationships. Actually, in many ways I feel this book is about building relationships, not only between humans and dragons, but also among humans. A solid foundation for the plot is the marriage and love between Dionelle and Reiser. Throughout the book we witness how they constitute their marriage, from the first hesitations and clumsy approaches, to the quarrels and misunderstandings, through anxiety and anger, but also through the love and the power of their emotional bond. The author lets us see the thoughts of both, their points of view, and makes us understand both Dionelle and Reiser, though they do not always understand each other. I was at first a bit disappointed about the traditional frames of the plot. It seems to be a rather old-fashioned pseudo-mediaeval world in this book, as I think often seems to be the case in many dragon books, and fantasy books as a whole. You have the kings, noble men, sorcerers, farmers, peasants, in addition to the dragons, demons and other dimensions. You have the stereotypical gender constructions, where men are in charge and women are passive, beautiful objects. And if a woman should dare to be active in the plot or speak up, she’s often presented as the evil witch or the frustrated heroine who ultimately gets killed, or married. Dragon Whisperer does this too. Dionelle is quiet, kind, and beautiful. She’s a perfect wife, daughter, sister and a perfect dragon whisperer. The marriage is arranged and she happily enters it. Dionella is born white as snow, another traditional symbol of innocence. There is the cruel sister who makes Dionelle seem even more kind and beautiful. As the book evolves, I can’t help but pity the evil and jealous sister and I can almost understand why she’s so aggressive, seeing the younger sister getting all the attention, and even the husband who was originally intended for her. Dionelle seems too quiet and too kind. Surely she is a sort of rebel since she wants to finish her apprenticeship, but it’s only so that she can have more time for the marriage and coming kids. Happily, the author has put in a few things to balance this picture, and I find that the descriptions of Dionelle is quite balanced in that she has her worries, anxiety, anger, stubbornness and so on too. It’s not all a bed of roses. I also like how the author weaves the plot around Dionelle as a mystery to be solved. In general, I liked this book, but it´s not completely without some minor flaws. I wished the author had tightened it a little bit more up, as some details seem a bit too, well, detailed. The end is also rather abrupt. Some places it would have been nice to be shown the events too, not only being told them through the characters. Nevertheless, these are minor criticisms of an otherwise nice and intelligent story. From what I can gather, Dragon Whisperer is Vanessa Ricci-Thode’s first novel with a publisher, and it was apparently written during a NaNoWriMo. That’s quite impressive. There is a lot of potential in this book for a series, which I hope the author considers. 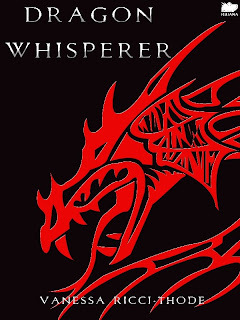 All in all, I feel that Dragon Whisperer is an entertaining book, worth reading if you’re fond of fantasy worlds, stories with female protagonists, and of course, dragons.